Why did Johnny Cash name his signature song I Walk The Line? - Newhillbilly website. 100% American Roots Music. 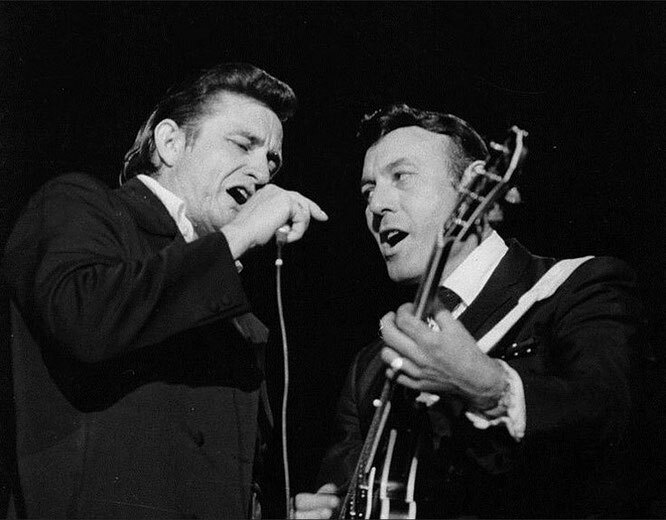 "I Walk the Line" is a song written and recorded in 1956 by Johnny Cash. After three attempts with moderate chart ratings, it became Cash's first number one hit on the Billboard charts. It reached number 17 on the US pop charts. It remained on the record charts for over 43 weeks, and sold over 2 million copies. It has also been used on many LP's released from Sun Records, such as With His Hot and Blue Guitar, Sings the Songs That Made Him Famous, and Sings Hank Williams. It was the title song for a 1970 film starring Gregory Peck. But the first title of the song was "Because You're Mine." Carl Perkins had a song withthe same title. The man in black discovered the coincidence. Cash simply didn't want to use the same title and changed it. "Because You're Mine," is an excellent rock song that Perkins cut for Columbia. Here's an outtake of the Perkins number.